Felted beads are fun and easy to create! are just a few examples of creations with this very versatile artisan component. so I can easily match them with my clothes and headbands. But you can also embellish your finished dry beads with seed beads or embroidery. Once you get started it is hard to stop! But why should you, the possibilities are endless. 2 - Fluff out the wool roving so you can pull out a strand of wool. and carefully (not too tight) wrap the ends around the knot. by rolling it up and wrapping it with wool. 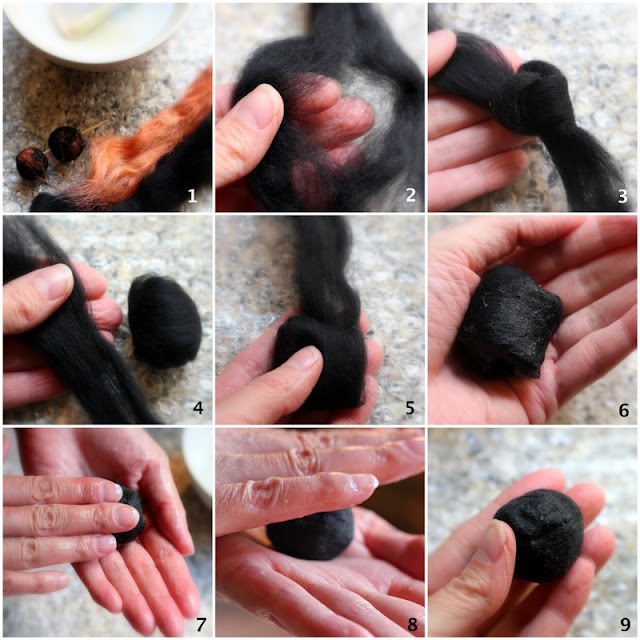 5 - Add more roving until you have the desired size. Keep in mind that the wool will shrink about 30 to 50%. and sprinkle it gently with some warm soapy water. otherwise you will flush away the fiber. get deep lines in the wool which are very hard to remove. roll it between the palms of your hands to create a round shape. decorative fibers to the surface anymore. 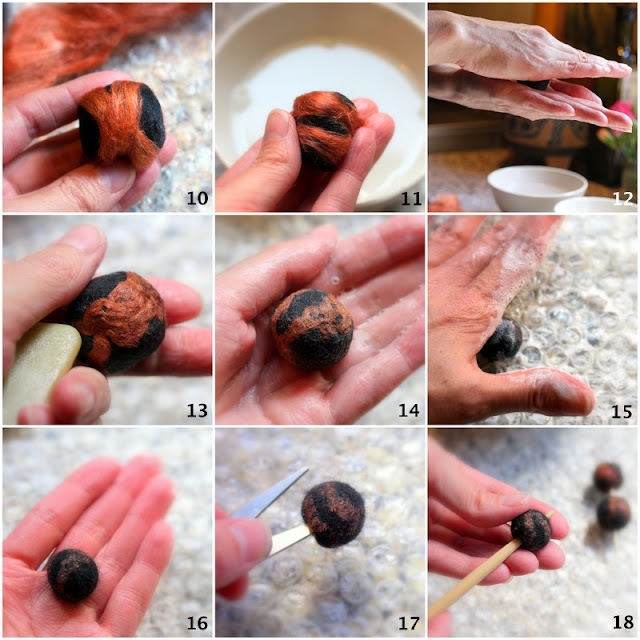 11 - Add some silk by wrapping it loosely around the ball. making sure not to flush away the silk fibers. adding more pressure. You can feel the ball getting firmer now. with the small piece of soap or with the tips of your fingers. 15 - Rinse the ball with clean hot water and soap it in again. foil or the towel, or between your palms. Repeat steps 15 and 16 until you have a firm ball. 17 - Once the ball feels very firm it is finished. to make sure all of the soap is rinsed out. Roll the bead on a dry towel a few times. small pair of scissors or an ice pick. twisting it. Make sure you do this on both sides of the bead. overnight on a warm spot. 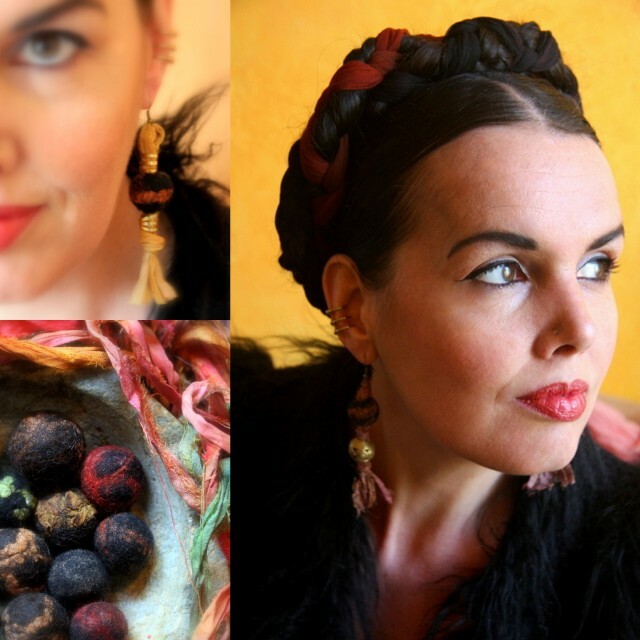 Have fun with your own personally styled felt beads! Sas, Everything you do or create is beautiful! Everytime I need some inspiration or a lift, I got to your dailycolours blog and the ethereal flower photos with perfectly paired poetry brings so much joy. All the best to you.